These Thai Inspired Shrimp Dumplings are easy to make, full of flavor and texture, allowing time to be spent treat yourself or friends | family to a delicious meal. 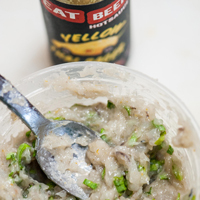 Eat Beer Hot Sauce Yellow Thai Racer becomes the vehicle of flavor, when combined with peeled shrimp | prawns as a protein, along with an egg white to bind the ingredients together, a touch of salt and splash of soy sauce. 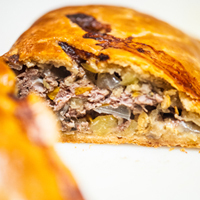 This all blends together to make a flavorful shrimp paste that can be used as a filling for these Thai Inspired Shrimp Dumplings or formed into several burger patties, creating a Thai Shrimp Burger. 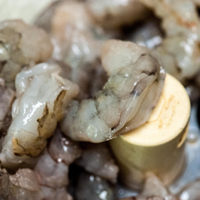 They may be also formed into small tablespoon shrimp balls and used in soups, ramen or pho dish. 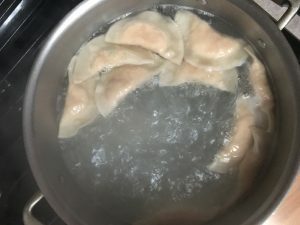 I wanted to make these dumplings easy to make, less hassle, no hunting down ingredients that might not be at your corner market or grocery store. 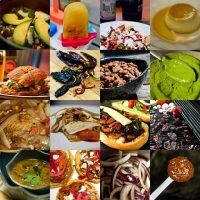 All the shopping and preparing has been done, the ratio of these ingredients measured, all for you. Depending on your heat level, add more or less Yellow Thai Racer. 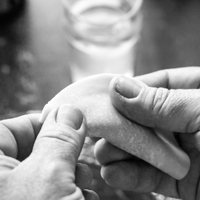 The hardest part is making the Dumplings, that once you make a few, you’ll get faster and better at them. 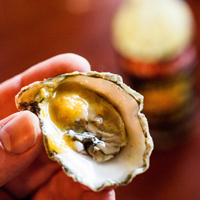 Boiled or fried, either way you cook them, they are delicious as an appetizer, bar snack paired with an IPA, dim sum feast or a midweek meal. 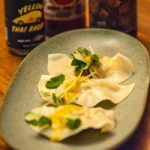 These easy to make Thai Inspired Shrimp Dumplings combine Eat Beer Hot Sauce Yellow Thai Racer into a shrimp filling for dumplings. Boil or fried, they make a great appetizer or entrée. 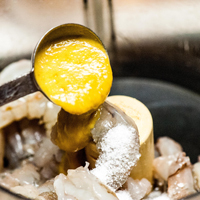 Peel and devein the shrimp | prawns and place them into the bowl of a food processor. Add the salt, egg white and Yellow Thai Racer Hot Sauce, more or less if you are more into mild or spicy! Then add the soy sauce | tamari | liquid aminos | shoyu. 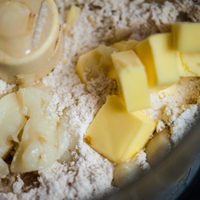 Fit the food processor with it's top and pulse the mixture to a course or fine paste. This will take about 30 seconds to a minute. Remove the Thai Shrimp Paste to a container or bowl and stir in the green garlic | onions, so that the paste has some extra texture. If using the optional ingredients, stir those in as well. 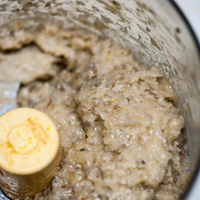 This mixture can be used right away or refrigerated for up to 2 days. Fill a small glass or shot glass with cold water. Have your wrappers open and a stack on your clean work surface. 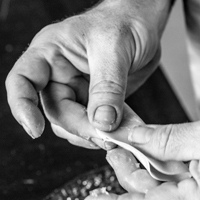 Working with one wrapper at a time, dip a finger into the water and coat the outside edge of the wrapper making a wet ring. 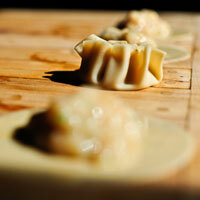 This will help seal the dumplings, preventing them from opening when they cool. Add a teaspoon of the Thai Shrimp Paste to the center of each wrapper. 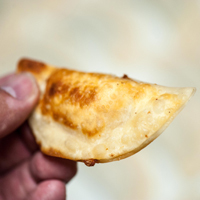 Fold the two opposite wrapper sides together, surrounding the Thai Shrimp paste in the middle. 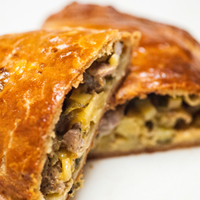 Starting at the far end away from you, press the two sides of the wrapper firmly together, using your thumb and pointing finger, lightly squeezing the edges together, while removing any air from around the filling. 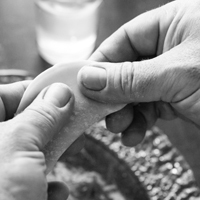 Work your fingers towards you, sealing the dumpling, moving the filling to the center of the dumpling. 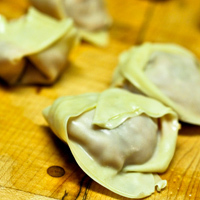 Make sure the wrapper is sealed, with no filling around the edges, or the dumplings will leak and may open when cooking. Once wrapped, place onto a sheet tray or cutting board, lightly dusted with cornstarch, to prevent sticking, if not using right away. 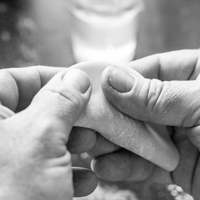 Repeat this process until all the dumplings are made. 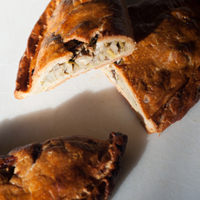 They can be cooked right away or covered with a clean towel and refrigerated for 6 - 24 hours. Boiling: Fill a large pot with water and bring to a boil. Add 2 tablespoons of kosher salt and have ready a skimmer. Add 6 - 10 dumplings to the skimmer and set it into the boiling water, lightly stirring the water, to prevent the dumplings from sticking to each other or the pot. Set a timer and cook the dumplings for 5 minutes. The filling will turn a light shade of pink | orange. Remove the dumplings from the water with the skimmer and place into a metal bowl. 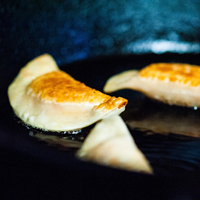 Add a few drops of toasted sesame or vegetable oil to prevent the dumplings from sticking to each other and lightly toss to coat. 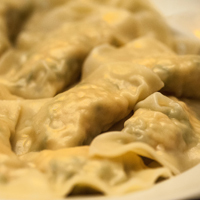 Repeat the cooking process with the remaining dumplings, serving immediately. Frying: Preheat the oven to 250°F | 121°C Using a deep fryer or a cast iron skillet, add enough frying oil, such as rice bran | sunflower | vegetable oil to cover the bottle by 1 inch. Using a thermometer or IR Laser thermometer, heat over high heat until the oil is 350°F | 177°C. 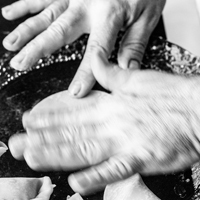 Add 5 - 6 dumplings at a time, making sure they aren't touching. Lower the heat to medium, so they don't burn, Cooking for 3 minutes a side. Flip once. 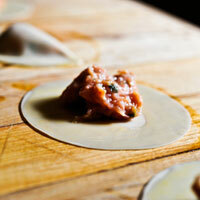 Place the fried dumplings onto a plate or sheet tray with a layer of paper towels, to absorb any remaining oil. Place into the oven to stay warm as the next batch(es) are fried. 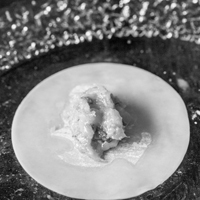 Transfer the hot dumplings to a serving platter or plate and serve. 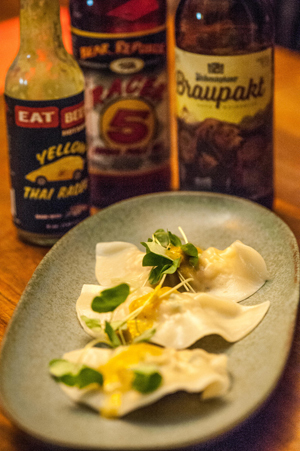 Try serving these Thai Inspired Shrimp Dumplings with either a dumpling sauce, more Yellow Thai Racer, soy sauce | tamari | liquid aminos | shoyu or Yellow Thai Racer Aioli.